We can’t understand human nature without understanding the forces of evolution that made us who we are. We are the happiest if we design our lives/societies around the human nature, like a well fitting glove is designed around a hand. Failed philosophies like Marxism and Objectivism are results of failing to design our societies around what evolution has made us to be. In a series of future posts, we will dissect the impact that evolution has on our nature. In this post, let us make sure that we have a clear understanding of how evolution works. Let’s start with an animal called ‘Grey Circle’. Due to genetic mutation, the some of the babies of Grey Circle are slightly different from the original. 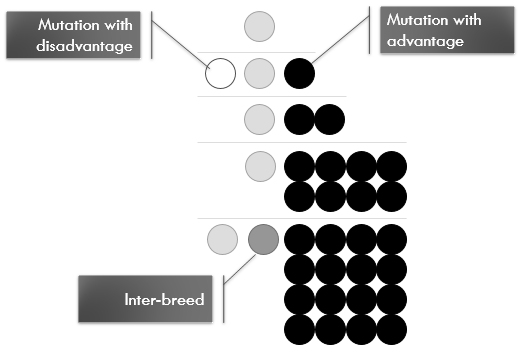 Of the three babies, the baby named ‘White Circle’ has mutation gives it a survival/propagation disadvantage (e.g. being born without limbs). The genes of the baby named ‘Black Circle’ were mutated in such a way that it has some special advantages over others (e.g. ability to run faster). And the baby Grey Circle has no advantage or disadvantage over its parent. Over the subsequent generations, White Circle doesn’t get to make babies because it dies early. Whereas the Black Circles ends up having more babies as they are very good at out running their predator. With every passing generation, there are more Black Circles in the population. Of course, Grey Circles and Black Circles may end up inter-breeding. But for the sake of simplicity, let’s ignore the effect of inter-breeding now. Eventually, the Black Circles dominate the entire population as they successfully out-compete the Grey Circles. Thus, a new population is born with a new trait. In another isolated part of the world, where the Grey Circles haven’t mutated into Black Circles, the Grey Circle population continues to thrive. Mutation is a messy business. It is never just Black or Grey. Mutations keep happening all the time, in million different forms. 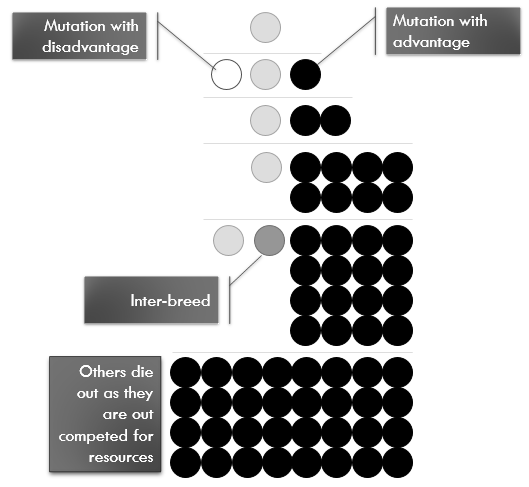 Some of the mutations/traits end up dominating the entire population (e.g. intelligence in humans) . 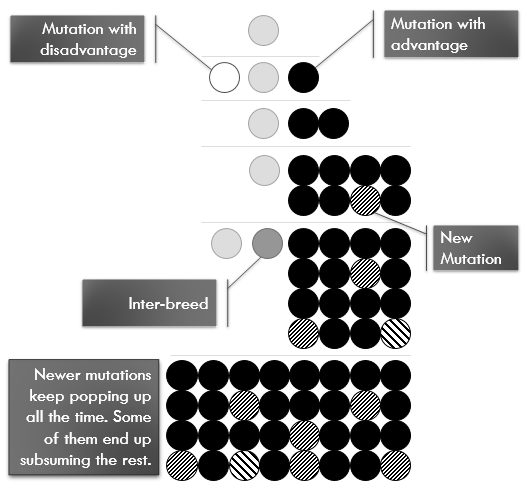 Some of the mutations/traits persist in the population, but they never fully dominates the population (e.g. skin color, super-intelligence, schizophrenia). Some mutations/traits get wiped off from the population immediately (e.g. anencephaly) or eventually. Evolution carries forward that traits that eventually dominate the population. Period. Evolution doesn’t care for good, bad, virtuous, evil, etc. When we hear the phrase “survival of the fittest”, we tend to confuse it with “survival of the superior”. Evolution is blind to anything other than population explosion. In the next post, we’ll look into three sub-types of evolutionary forces.